I think these potatoes really speak for themselves. There are countless ways to make great mashed potatoes. This is my favorite way though. Lots of fresh chives and sour cream with Yukon gold potatoes is the perfect compliment to just about anything. I leave the peels on the potatoes, but you can peel them if you like. I just used my potato masher, I like them to be a little chunky. You can also use a food mill to bet a finer texture. They are so perfect, they don’t even need gravy! Wash potatoes. Peel if desired. Cute in quarters and add to a saucepan. Cover potatoes with water, add salt, and bring to a boil. Boil over medium heat until potatoes are very tender. Drain potatoes and add back to the saucepan. Add sour cream and 1/2 cup milk. Mash potatoes with a potato masher. Add more milk until you get the desired consistency. Add chives, adjust salt and pepper to taste. Oh my I love mashed potatoes, thanks for sharing! .-= Drick´s last blog ..Ancho Chile Rub =-. 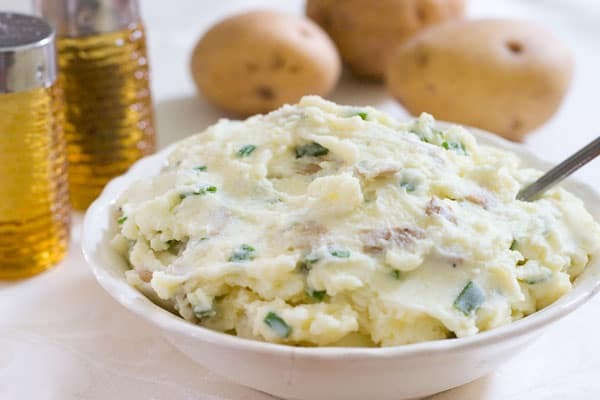 Your mashed potatoes look AMAZING and so flavorful! mashed potatoes with sour cream is always my favorite and chives are a great addition! .-= 5 Star Foodie´s last blog ..International Incident Party: Wild Little Plum Pizza Pie =-. Thanks for this recipe; it was simple and yet it came out great! I added some onion powder in the water when boiling the potatoes. They are so tasty! I also think that Yukon Gold’s do make the best mashed potatoes and they are all I ever use. You can make them with no butter or oil at all and nobody notices. I always get asked what I did to make them taste so good. My family also prefer them with the peelings on. Also I have found that I like them mixed with a small can of Cream of chicken condensed soup, some cheddar and with some garlic too. yum, such a classic. i love mashed potatoes! .-= Brie´s last blog ..Cocoa and Fennel Frond Crusted Chilean Sea Bass, Shiitake Mushrooms with Fennel Stalks, and Chocolate Drizzled Fennel Bulb =-. I must try the recipe to make some mashed potatoes! Look totally irresistible. .-= Angie’s Recipes´s last blog ..Cucumber Relish =-. Such a classic! My boy loves mashed potato to death, he can literally only eat it but NOTHING! Have not tried to use sour cream for quite some time, thanks for the perfect reminder! .-= lululu´s last blog ..Arroz Con Leche (Spanish Rice Pudding)…and a CHIC BABY GIVEWAY! =-. I love making smash potatoes this way. They remind me of sour cream and onion potato chips! It is 9:45pm and I am now totally craving these potatoes! Wow, those look delicious! .-= Kristen´s last blog ..Nostalgia (Recipe: The Altamont Grade School Poor Boy) =-. I think chives and potatoes are one of the most perfect combinations out there! This looks delicious.